Ice hockey in the tropics? 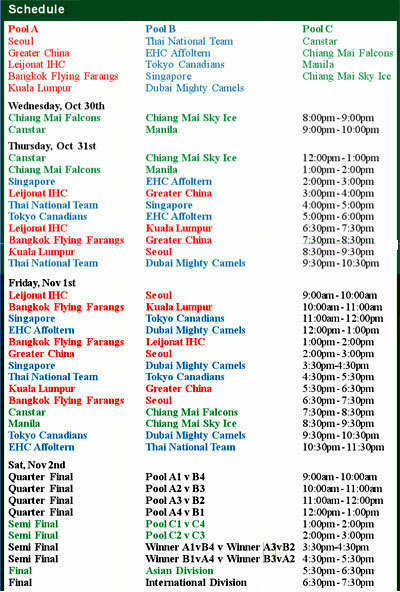 Sure enough, the OK Cup International Ice Hockey Tournament is scheduled get underway next Wednesday, October 30 at the Bully Sky Ice Skating Rink in the Kad Suan Kaew shopping complex off Huay Kaew Road, just outside the northeast (or Hua Lin) corner of Chiang Mai City. Ice hockey teams from Korea, Hong Kong, Mainland China, Malaysia, Singapore, Japan, Philippines, Dubai, Switzerland, Finland, Thailand and two teams from host Chiang Mai will face off for the coveted OK Cup. Games will begin at 8 p.m. Wednesday, October 30, noon on Thursday October 31, and 9 a.m. on Friday and Saturday November 1 and 2 (see schedule). The format in the International Division will be a round robin for teams within their pool, with the top four teams advancing to a cross-over quarterfinals, and hopefully for them, onto the semifinals and finals. The format in the Asian Division will be a round robin within the pool, which will determine rankings 1-4 for the quarterfinals and semifinals. Each game will be two 20-minute periods. Two points will be awarded for each win, one point for a tie. Quarterfinal rankings will be based on points, or in the case of ties inside the pool, wins, head-to-head competition, least goals against, least penalty minutes, and finally goal differential. In case a game should end in a tie, then an 8-minute, three on three overtime will be played. If the game is still tied after that, it will be decided by a three man shoot-out, except for the final when additional 8-minute overtime periods will be played until a winner is decided in overtime. Chiang Mai’s dynamic table tennis duo Atip and Aekapop took one first and two second places in the 7th Tibhar Table Tennis Tournament played in Pattaya earlier this month. Champions of the 7th Tibhar Table Tennis Tournament display their hard-won trophies. Chiang Mai’s dynamic duo of Atip and Aekapop brought back three trophies, one first and two second places. The two rising table tennis stars, neither of whom is over 14 years old, won the Boys’ Under 14 Doubles over the host team of Apivith and Attaphon from Mike’s Tibhar team. Atip and Aekapop then stepped up an age class and finished second in the Boys’ Under 18 Doubles category, narrowly missing a doubles sweep. Aekapop then added to his team’s trophy cabinet by finishing second in the Boys’ Under 14 Singles Division. The 7th Tibhar Tournament, held October 12 and 13 in Pattaya, drew competitors from around the country and from various part of the world. 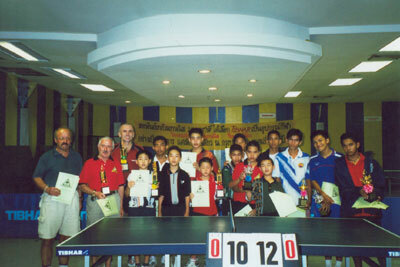 Over 150 table tennis players competed in the tournament, coming from as far as Chiang Mai in the north and Ranong in the south from Thailand, and from Europe to represent an international contingent. Many were preparing for the ‘big’ tournament to be held in December this year. The international over 40s nearly stole the show, as the team of Thomas from Mike Tibhar and Pierre from Switzerland put on quite a display en route to winning their doubles match over Somyos and Montri from Ping Pong Pattaya. Next month, Saturday & Sunday November 9 and 10, will be the final round of monthly matches before the 3-day tournament in December, which will have 100,000 baht in prize money up for grabs. 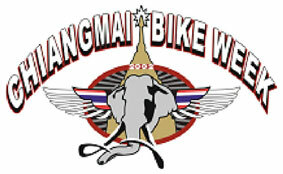 Planning for the Chiang Mai Bike Week is going full speed ahead, and organizers are nearly ready already. The event is scheduled to take place December 6-9 in Chiang Mai. The Chiang Mai Bike Week project is a travel and tourism based activity for members of large motorcycle clubs both within and outside of Thailand. Proceeds from the project will be added to the funds of the Region 5 Provincial Police’s Anti-Drug (methamphetamines) campaign, as well as to aid the tourist police and other charity organizations. In addition, the project encompasses the promotion of tourism in Chiang Mai and other provinces in Northern Thailand, the use of helmets in accordance with Thai regulations and traffic laws, the exhibition of motorcycles, and competitive games in order to establish and strengthen relationships between all motorcycle enthusiasts. Last but not least, allow us to host a charity ball. The Chiang Mai Bike Week project was first organized in Pitsanulok in 1999 by the North Comets Motorcycle Club (Chiang Mai), a club for motorcycle lovers and the organizers of motorcycling activities in Chiang Mai. About two hundred motorcycles participated in this first event. The following year, the event was held in Chiang Mai and named, “K9 Drug-Busting Project” and the number of participating bikes and riders rose to three hundred. Most recently the project was re-named “Chiang Mai Bike Week” and has been very successful, with no less than eight hundred participating members and bikes from a convention of motorcycling clubs from all over the country, including the Immortals MC (Harley-Davidson Thailand) Club, Nationwide Harley-Davidson Clubs, BMW Motosport Club (Thailand), Siam Biker Club, Hanuman Club (Had-Yai), Southern Big Bike Club, Rider Club, and Jumbo Club. Also included are motorcycle clubs from other parts of the world, including Malaysia, Singapore, Saudi Arabia, Hong Kong, Germany, Poland, and England. This year, the organizing committee has coordinated with a number of motorcycling clubs around the world and incorporated a wider public relation’s campaign. Due to the success in the events of previous years, it is expected that international participants will rise to 300 machines and the event will be considered a very large gathering to reflect the promotion of something of great social value. This in turn can be used to promote the country and the unity and harmony in Thai society in the eyes of foreigners. It can also be considered as promoting the tourism industry to participating foreigners which, in the long term, will eventually draw tourist money into the communities in the Northern Region of Thailand. 13.00 Exhibition of motorcycles (Mini Motorcycle Show) to display or demonstrate products and services of the sponsors of the event and the display of motorcycles from the various participating clubs. In addition, there will be activities and other games, such as eating hot dogs (or banana) while riding and the Miss Chiang-Mai Bike Week 2002 pageant. 19.30 Official Party or Charity Banquet with acknowledgements and thanks to sponsors and participating clubs. Wing 41 of the Air Force recently hosted a friendly soccer tournament to develop better relationships between the army, air force, police and mass media, so that the four separate Chiang Mai entities will be able to cooperate better in future endeavors. Teams from the army, air force, police and media prepare for friendly competition. The four teams that competed were from the 33rd Military Circle (Kavila Camp), Chiang Mai Provincial Police Division, Chiang Mai mass media and Air Force Wing 41. 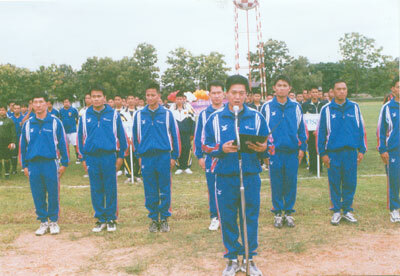 The matches were held at the Wing’s main stadium, and the winner received a trophy from Group Captain Arnond Jarayaphan, the commander of Wing 41. The U.N. Irish Pub & Restaurant, on Rajawithi Road opposite Denchai Photo Shop, has been organizing a very popular trivia quiz every Thursday night. Paul Pitcher, the quiz master, said that the British pub quiz concept was one that he was very familiar with, having worked in pubs for many years. The quiz starts at 8.30 p.m. on the 2nd floor of the pub and usually finishes about 10.30 p.m. Each team pays 100 baht to register, no matter how many players in each one. There are 5 subjects and 1 handout round with 10 questions on each subject covering general knowledge, music and entertainment, literature, science and nature, and current affairs from the previous week. The winner gets a free beer and 750 baht, the second place gets a free beer as well and 250 baht, and the third place a jug of beer. There are also booby prizes. The Thursday night competition is open for everyone said Paul Pitcher. Mae Hong Son provincial authorities in cooperation with the Sam Mork Bicycle Club and the Lions Club of Mae Hong Son Pangtong will hold the first “Sam Mork Bike Ride” mountain bike competition at Mae Hong Son Province on November 17 this year. The competition will start 6.00 - 12.00 a.m. beside the Mae Hong Son Court with the entrants competing for a cup presented by the Minister of Public Health, Sudarat Keyurapan. This will be the first mountain bike competition held in Mae Hong Son promoting the tourism to the region. 2. Promoting the Buathong (Mexican sun-flower) Flower Festival in Mae - U - Kor Mountain, Mae Hong Son. 3. Supporting the sport of biking. 4. Encouraging youngsters in Mae Hong Son to exercise and deter them from using drugs. Anyone interested in this event should apply at the Sam Mork Bike Club, 053 612101; Thailand Sport Gymnasium, Mae Hong Son, and K.T. Sabai Ice Making Factory before the competition date. Ray Matti scored his fourth Hole-in-One on October 9th playing the ‘A’ Course par three 2nd hole at Waterford Valley, Chiang Rai. Ray just needed an eight iron and a Nike ‘spin control’ ball to successfully negotiate the 155 yards from the blue tee and was duly rewarded with a one-year Gold Membership at Waterford Valley. Ray’s playing partner on the day was Rick Cherry, a professor at Chiang Mai University. Well done Ray! Anusorn Sawetkunchorn, the chairman of the Khum Khantoke working committee, announced that the Khum Khantoke Family Rally will take place November 16, beginning at 8 a.m. in front of the Khum Khantoke parking area on the Chiang Mai - Lampang Road. The rally is being divided into two categories: overall and for ex-professional VIP’s. Overall first will win 10,000 baht, with 6,000 baht for second and 3,000 baht for third. All the winners will receive trophies, including the winner of the VIP class. The Minister of Tourism and Sports, Sonthaya Khunpluem will present the trophies for the overall class. The Deputy Minister of the Interior, Pracha Maleenon and the consulting chairman of the Deputy Minister of the Interior and a member of House Commission for Tourism Surapol Kiatchaiyakorn will give the trophies for the VIP class. The event is being billed as a celebration of Loy Krathong tradition and a leisure holiday trip. Anusorn Sawetkunchorn said that this program aims to promote Loy Krathong Culture, Khantoke (Thai northern style) dinning and rallying in Chiang Mai. For more information, call in to the Khum Khantoke Restaurant. A new dimension for tourist experiences is being enthusiastically promoted by Doi Saket District, according to Chiang Mai Adventure Flying Club and the Oriental Balloon Flights. 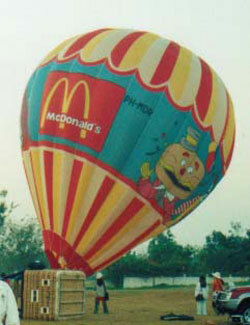 Up, up and away - see Chiang Mai like you’ve never seen it before, from way up high in a colorful balloon. Prayod Chaimongkol, the president of the Chiang Mai Adventure Flying Club, said that the club is offering scenic flights over Chiang Mai, costing only 1,200 baht for 15 minutes or 2,200 baht for 30 minutes including transportation from the city. Wonnapa Takaew, of Oriental Balloon Flights, said they offer once in a lifetime experience flights to view the beautiful local countryside with balloon trips, which can cater for groups of four, six or ten people for a one to one and a half hour flight. The flights start daily from 7 a.m. covering a radius of 5-10 km from the launch site. Balloon flights run from the middle of October to the end of March, as the weather is not suitable at other times of the year. This new tourism adventure travel is being supported by Doi Saket District. “Doi Saket is located in the northeast area of Chiang Mai, which is safe from the aviation point of view,” said the president, Samarn Pangwatcharakorn. Chiang Mai is ready to hold the 1st Asian Transplant Games in November this year. It will be at the 700 Year Anniversary Stadium and all Asian members from 28 countries will be invited to participate in 8 sports. Princess Galyanivadhana will be presiding over the tournament’s opening ceremony. Phaibul Jitprapai, the president of the Transplantee Society of Thailand said that he will be pleased to welcome transplantees from all over Asia and nearby countries to attend the First Asian Transplant Games in Thailand November 3 - 9 this year. Udom Puasakul, Chiang Mai’s deputy governor, who is also the chairman of the organizing group, said that the tournament will encourage people to become interested in organ donation. There will be extensive media promotion both in Thailand and abroad and it is hoped that local enterprises will assist. The Transplantee Society of Thailand is supported by the Sport Authority of Thailand, the Sport Authority Region Center 5, Chiang Mai Provincial Administration, and the Chiang Mai governor in promoting the tournament. Sports being represented include athletics, badminton, table tennis, bowling, tennis, golf, swimming and petanque. The National Elephant Institute (Thai Elephant Conservation Center), and the Forestry Industrial Organization in co-operation with the Lampang Bicycle Club will hold a cross-country mountain bike tournament called the 4th Elephant Conservation - Thungkwean Mountain Bike on October 27 at Thungkwean Park. Elephants at work in a Chiang Mai. They won’t actually be competing in the mountain bike race, but riders will be competing for their benefit. The tournament will be divided into A, B, junior, VIP, and family classes. The entrance fee is 100 - 350 baht. There will be tents, food and toilet facilities available for the riders. In addition, there will be a show put on by the Lampang students starting at 9 a.m. The competition will publicize mountain bike riding activities and generate income for the Thai Elephant Conservation Center, which supplies elephants’ food and medicines. For more information, please contact the National Elephant Institute Tha-Ma-O Road, Muang District, Lampang, tel. 0 5422 8108 or at Thungkwean Park tel. 0 1885 3697. He said under the tour program, tourists get a rare opportunity to get a bird’s eye view over Chiang Mai in a glider provided by a private company. The program, which includes a city tour, will bring adventure lovers to visit Wat Phratad Doi Saket, Mae Kuang Udom Tara Dam and other famous historical sites, said the district chief. Apart from getting a first hand experience of rural life, tourists, almost all of whom are foreign tourists from Japan, England, France, and China, would also be able to buy local products which could generate income for poor villagers. Sqn. Ldr. Prayod Chaimongkol, head of Chiang Mai Ultra-light Flying Club said that the club - officially certified by the Department of Aviation - offers flying lessons, training courses and ultra-light aircraft flying services for tourists to view the mountainous region of Chiang Mai from the air. “The powered aircraft are safety-guaranteed as our qualified pilots are well-trained,” he said, adding that the club is open every day from dawn to dusk. Welcome to Fitness Tips - a weekly look at fun and easy ways you can keep fit. This week we’ll keep it short and go off into a couple of different directions, but both basically focusing on water. A study released recently by a team of Japanese scientists found that 15 minutes per day in a sauna might improve cardiac function in heart failure patients. The study analysed two groups of people with stable, moderate heart failure. The first group spent 15 minutes in the sauna, followed by half an hour rest under a blanket every day for two weeks. The second group spent 45 minutes in bed rather than a sauna. Ultrasound tests were performed at the beginning and end of the study testing the blood for BNP, a protein marker that indicates how well the heart is pumping blood around the body. Blah, blah, blah and so the study went on; the findings indicated that the combination of 15 minutes in the sauna and the half hour rest appeared to reduce stress on and the function of the heart. Have a think about it. It has long been recognised that weight-bearing exercise is beneficial in maintaining and increasing bone density. But how beneficial is aquatic exercise, which primarily reduces impact, for participants with osteoporosis and other problems involving bone density? Studies to date cannot conclusively show that aquatic exercise creates positive bone mineral balance; however, they do show that aquatic exercisers gain muscular strength, improve range of movement and increase cardiovascular fitness. Research also indicates that participants build bone at the same rate if exercising on land or in combination with water exercise. Therefore, participants improve functionally, but don’t actually reverse the osteoporotic process. Impact loading seems to be the essential element in increasing bone density, so how can you effectively use aquatic exercise to help osteoporotic participants? Use aquatic exercise to improve fitness and when the participants are strong and stable enough incorporate dry land exercises as well as continuing their time in the pool. This will maintain and improve strength, range of movement, overall fitness and all the other benefits that aquatic exercise has to offer.